Make sure you’ve had your afternoon tea before sitting down to enjoy the comically hilarious adventures of Sir Albert Wickes and Clarence Baxter in 39 Days to Mars. Set in the 19th century, you and another (hopefully) bright friend, will travel to Mars on your spaceship. Encountering some obstacles along the way, this puzzle driven adventure game keeps you on your toes as you journey through your house and in the vacuum of space. Although relatively short, 39 Days to Mars has a simple story combined with challenging puzzles but a great experience nonetheless. Within the first 15 minutes, my friend and I were already stuck on constructing the map, but I appreciated that the game made us work for it. A suitable amount of time passes before a hint is given which leaves room for player growth and understanding. The adventure comes to us from independent developer Philip Buchanan. I was able to join his discord channel and discuss the different aspects of the game. Puzzles, being the main progression method, was the main topic. It was also interesting to see what other people had trouble on as it was always different. I find that everyone struggles with different puzzles-I guess to do with the way you think about things. It’s made balancing them really difficult! If you ever played the eerie puzzle centric and narrative driven series Myst growing up then you might see some resemblance from how you progress through the story. The two step process of understanding how things work for a certain puzzle and then understanding what you need to do in order to solve it is something the game does really well. Where it really shines though is the witty banter between Albert and Clarence. Also, before any puzzle was to be solved atop the ship, Albert always had to have his tea. This is probably the most British game I’ve ever played. Even making tea was a puzzle as I mucked it up plenty of times. The subtle nuances capture the games charming atmosphere. Drawing inspiration from the steampunk era, the 2-D hand drawn sketches have depth and character with dark tones to contrast the lit background. When problems arise in the ship, your eye is drawn to them by darker tones. During the process, Philip played with different ideas so as to make the ship aesthetically easy to look at and identify what you need to do. Playing with colour grading and using different lighting could be a way to slit up areas of the ship and draw the eye to the current problem. Having only played through it once, I’m sure there is more to explore and discover. I ended up crash landing on Mars after a cascade of failures on my friends part. I’m perfect. He messed everything up. That being said I know there are at least two more endings, maybe more! All of this is accompanied by jaunty piano music that transports the player to another space. See what I did there? Like I said before, the game is relatively short if you were to play it in one sitting, around an hour or more if you really take your time and are quick to solve puzzles. Although, this is the perfect duration for a game like this. 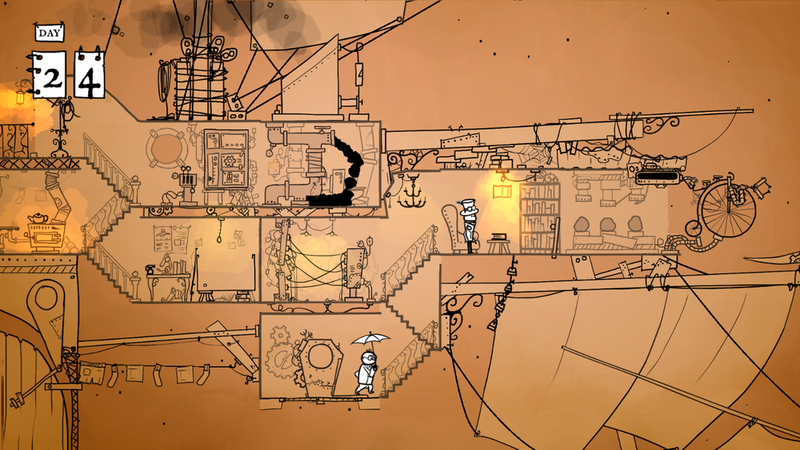 39 Days to Mars is available on steam for $12.00 if you feel so inclined. This has been another edition of my article series, Indie Spotlight, and a worthy addition at that. Challenging puzzles, unique art style, and the simplistic nature of the story are all inviting qualities of this game. My only wish is for more exploration once on Mars. Who knows? Maybe in the future we’ll get to see our two bold adventurers encounter some martians. Until next time!